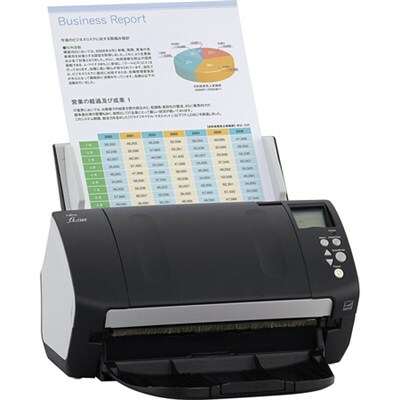 Organizations of all kinds rely on Fujitsu scanners for their paperwork processing. Small enough to fit on any desk, yet powerful enough to sail through up to 4000 scans a day, the fi-7160 Professional Duplex Scanner is unmatched in its speed, accuracy, reliability. Scan mixed file batches of varying sizes and thickness (receipts, credit cards, etc) in one run. The fi-7160 will accurately captures your data and crops each image to the correct size, while also cleaning up documents automatically to ensure clear scans. Ultrasonic Double Feed Detection identifies sheets stuck together so you don't miss any pages. Our Intelligent MultiFeed capabilities also allows easy manual bypass for sticky notes, taped receipts, and labels. Acoustic sensors protect your documents by "listening" to your paper feed. If it hears a misfeed, the sensors will stop your machine immediately to prevent your documents from becoming damaged. The fi-7160 Deluxe Bundle combines best in class hardware with powerful PaperStream Capture Pro software. Easy to use and simple to set up, PaperStream Capture Pro enhances the fi-7160's superior scanning abilities with features that include options for high level data extraction and indexing, the import of electronic images and support for multi-station licensing. PaperStream Capture Pro will help you clean up your scanned documents and improve OCR, while offering a user friendly interface that allows for easy operation from start to finish. The fi-7160 Deluxe Bundle increases productivity without hidden costs, and will help you digitize your documents more efficiently.